Numerous vignettes of personalities and happenings in the Pass are presented as graphic anecdotes that are refreshing to the reader. These include the Social Club, a Duel in the Pass, the Inn by the Sea, and many more. The history of the Yacht Club, the building of the Harbor and Marina, the Pass Lighthouse, the Town Library, Mardi Gras, Fleet Blessings, Seafood Festivals, St. Paddy's Parade, and Christmas-in-the-Pass are reviewed from their inception. Jazz-in-the-Pass is remembered as the first New Orleans Jazz funeral ever held in Mississippi was prompted by the death of the Pass's own internationally famous Captain John Handy. The early growth of Catholicism and Christian base faiths are elucidated in the histories of St. Paul Church and Trinity Episcopal Church. 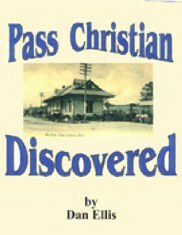 The Railroad Depot of the 1880s was chosen for the cover of Pass Christian Discovered. Dan Ellis pursues the trail of early history to current times as he adds another heritage legacy to his Gulf Coast history series. The enfolding takes place with the early French colonial settlers through the changes of governments to the English, the Spanish, the short period as an Independent Republic, and the raising of Old Glory at the Bay of St. Louis. The Antebellum period from 1815 to 1860, is reviewed in detail as it reflects the era of developing mansions and resort hotels that vied for visitors from New Orleans and Natchez, that traveled the early schooner route through the Mississippi Sound. The Pass Christian Hotel and later, the Mexican Gulf Hotel were the hostelries that attracted thousands of tourists to the Pass. Harbor canning factories were established to export oysters, shrimp, and fish. They became commonplace along the Gulf Coast during the early 1900s. Immigrant workers were provided with housing that were called Row-houses. Other points of interest include the naming of principal streets, the Camille Calamity, the origins of Henderson's Point, Pass Christian Isles, Timber Ridge, Kittywake and the impact of the early French settlements at Cat Island and Wolf Town – renamed DeLisle. Other books about Pass Christian published by Dan Ellis are: Images of America – Pass Christian, Jubilee 3 – St. Paul Catholic Sesquicentennial, Pass Christian – Historic District & Lost Mansions. Unpublished booklets include: Henderson's Point; Black Heritage – and First Ladies; Mother of Mercy – Catholic Church; The Handy Man on Sax – Captain John Handy; and scores of Newsletters written for the Tricentennial Committee and Timber Ridge Association.